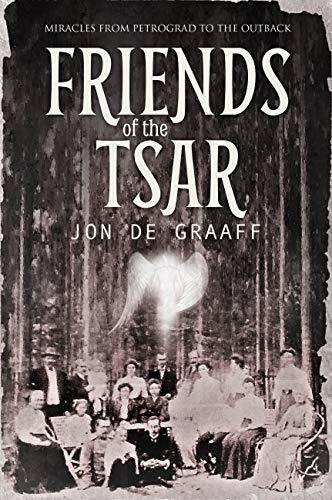 Friends of the Tsar, by Jon de Graaff, is a story about the author’s “Aristocratic Grandparent’s harrowing escape from the Russian Revolution of February 1917.” The story starts near Petrograd, Russia in 1916 with Vera and George, with George and his mother, Adelaide, saving Vera from a wolf attack. They are at the country estate of George’s father, Baron Alexander Zuckschwerdt. Adelaide and Alexander are very much aristocrats. Vera and George are not on board with the aristocratic ways of their parents. Vera, who also came from an aristocratic family, started rejecting her parents’ ways after Bloody Sunday when even children were killed during a protest. Vera has ten sisters. Three of them come to stay with her. Monica is 16. Mary is 15. Natty is 10. Vera often gets strong premonitions when something bad is about to happen. Blue is Alexander’s friend. He is an Australian cattle breeder. He comes to stay as well. Blue saves Natty from choking. He learned how to do it on a chance visit with friends. Vera sees it as meant to be. Blue tells story after story of things that happened that seem to have a lot of coincidences. Vera does not see them as coincidences at all. He dismissed them as being luck in the past. He now thinks differently. The family finds itself in trouble. The country is in trouble. Their money is not worth as much. The people in the country are starving. The family decides that they need to leave. Blue offers to let them stay with him in Australia. Alexander books passage for himself, George, Blue, Vera and the girls for February 27, 1917. The story goes on from there to cover how they escaped and the challenges they faced as they did. I felt that the story could not decide on what the book was going to be. As I went from chapter to chapter, I felt like many of the chapters could have been stand-alone chapters and were not connected very well. It lacked continuity. There are different stories being told that don’t seem to reach any conclusions. At first, I thought the book was going to be a love story about Vera and George. After the first chapter or so, they seemed forgotten and the book focused on Blue’s stories. Then it would jump to near misses while trying to escape and spy stories. I found myself confused a few time. The language seemed a bit stilted and formal and did not flow like normal dialogue in places. There is a good story in the book though it would benefit from a bit more organization. The author writes well. Some of the stories were definitely interesting. Some of the story lines had definite possibility and begged for further development as the characters were intriguing and were usually placed in exotic locations. Song follows Rayph Ivoryfist as he gathers his friends to return the prisoners that escaped from Mending Keep. What was your inspiration for the setup of the story and how did that help you create the ending? When you first sat down to write this story, did you know where you were going, or did the twists come as you were writing? When I started writing the story, I had the prison break. I had the characters of the Manhunters themselves, and I had the villains. But when I write all my books, I do not know exactly how it will end or how the plot will progress. All of that comes to me as I write. This book just kept surprising me. I would write a scene and see that it was going in a completely different direction. I would write something and see a twist coming down the road. I let a friend read this book before it was published. His criticism of the book was that it paid off too many times. He said it reaches one climax after the next. I think Song is unique in the fact that I spend 250 pages setting up four different climaxes. But it wasn’t planned. The book is just complex. As always, your characters are thoroughly developed. What is your writing process like for creating characters? When I write a character, I like to do away with all archetypes. I think they get in the way. When I meet somebody in real life, I don’t think to myself, “Oh, that person is an underdog.” or “Oh, I know people like this. This guy is a survivor.” Those aren’t the kind of things that hit me when I meet someone. So why would I think that when creating a character? A lot of people talk about knowing the motivation of your characters. But motivation is pliable. I can tell you why Rayph does a thing because I want him to do it. The traits I like to concentrate on are my characters’ hang-ups, the things that bother them, the things they cannot tolerate. I think too often writers create characters in a bubble. They try to describe their character in artificial terms. They create a character outline or a character spreadsheet. They try to create their character in a sterile environment. But that’s not how we get to know people. I like to think about character creation as going to a soup kitchen and meeting people there. Real lives, real problems. Well it’s already written. The entire Manhunters series is completed. I will be doing some rewrites and final touch-ups of course, but the story’s already been told. The second book in the series comes out April 15th. It’s called Hemlock, named after the city that is the poison capital of my world. In this story, the main villains the Manhunters find themselves up against are vampires. These are not vampires as we know them in the modern world. I took inspiration for my vampires from the original legends. This is before Anne Rice, stories centuries older than Bram Stoker. In the original vampire legends, they were all monsters. No good, no mystery, no romance, just vicious monsters. When they were hungry, they were pale. After they fed, they took on a ruddy complexion. And when they were full, they were a close shade of purple, because their bodies were suffused with blood. My vampires are old and powerful, nearly immortal, and diabolical. 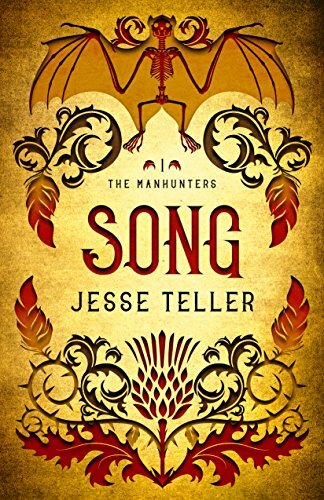 Vampirism spreads like a poison, like a plaque, and the Manhunters fight to stem the tide. So look for it April 15, 2018. Some of the darkest minds in Perilisc attacked Mending Keep, releasing all its prisoners. Despite his strained relationship with the crown, Rayph Ivoryfist calls old friends to his aid in a subversive attempt to protect King Nardoc and thwart terrorist plots to ruin the Festival of Blossoms. But someone else is targeting Rayph, and even his fellow Manhunters might not be enough to save him. Detours in Time follows Professor Milton, who invented a time-traveling car, and his assistant turned traveling companion Tabitha on their adventures through time. What was your inspiration for the setup to this entertaining novel? I’ve subscribed to several writing sites over the years that offer writing prompts. It simply started out as a response to a writing prompt. After a while, imagining this story became a great escape for me. The element of escape is what kept me going with this story. That, and the headlines we’ve been seeing in America during pre and post-election. They truly can get an imagination going. Time travel is always filled with paradoxes. Are there any that you had to deal with when writing this novel? Well, there is possibly an issue with going back in time and seeing yourself, or the possibility that you cannot physically inhabit a time in which your body is already inhabiting. I don’t think we truly know the answers to that question, so I mostly went with the “what-if” factor through a lot of my story. What if you could inhabit a time where you already exist, wouldn’t you want to avoid bumping into yourself? I would say, yes. So that factors in to one part of my novel. Then, there is the concern that you must not bring anything back from the future, which becomes an issue at another point in the story. It could mean that a different person discovers the formula for artificial sweetener, thereby ruining another person’s life, which means they may not produce the children they had, leaving a hole somewhere in the rhythm of the universe. I was a natural-born worrywart, so I’m used to thinking like this. With these types of time travel stories most people draw a comparison to Doctor Who or Back to the Future. I suppose the dividing line being familial involvement. What of these two fictions do you enjoy better and where do you think your novel falls between these two? I would say it falls closer to Back to the Future, except the scientist is taking a young lady, Pinky, with him. That young lady might be comparable to Marty, except her personality is much different. I was such a fan of that series, and so was my son. It’s a happy memory for us both. I also had a dear friend who shared a love of this series with me who is no longer with us. It brings back memories there as well. I suppose that is why there is so much familial involvement in the storyline. Family is such an important thing to me, so it was part of the building of my characters, despite the fact that Pinky has been without her family and forced to be self-reliant for some time. You may say there’s a resemblance to Dr. Who because of the female companion, however, I don’t think there is much more that is similar. I have enjoyed Dr. Who but never was able to watch more than one season. What is the next story that you are writing and when will it be available? I have so many ideas spinning around! Most likely, what I will publish next is a book of paranormal stories, since I haven’t published in that genre yet. I have the stories and just need to edit, proofread, and polish. 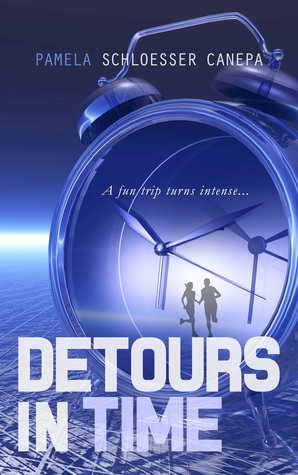 I also have 50,000 words done for the Detours in Time sequel, but I like to get good editing and beta reading before publishing a novel, so it won’t come out until next year. I plan to flesh that sequel out during NANOWRIMO, which really drives me to produce. I have the Made for Me series which takes place in the future, and plan to work on a book 3 to uncover secrets about the main character parental lineage which has been a mystery so far. I think that one will also come out next year. On a whim, feisty Tabitha takes a trip to the future with her trusted friend Milt, an awkward Science professor. Wonders and curiosities abound. However, their amusing journey soon becomes a challenging maze of difficult decisions. When an unplanned detour occurs, the two set events into action that may save one life and yet destroy another. Can these friends of completely different mindsets agree on a course of action? Amid the backdrop of a future that reveals great wonders and horrors, Detours in Time starts as a fantastic escape and grows to present many moral dilemmas and surprises that can either destroy the strongest friendship or bring two people closer. A futuristic, dystopian story which combines elements of mystery, tension, and eccentricity. The Wagon Driver is one of David Berardelli’s many stories inspired by the works of Ray Bradbury, Theodore Sturgeon, Ian Fleming, and Rod Serling. 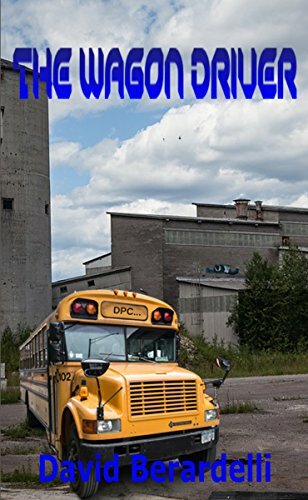 The story is set in the not-so-distant future where eighteen-year-old Kyle Sonnet lands his first job as an employee of the Department of Population Control. Population control is the pivotal theme throughout The Wagon Driver, and leaves the reader to believe that Earth’s population is more than it can bare. To resolve this issue, wagon drivers are required to follow ambulances and collect bodies and dispose of them. Unsettling, don’t you think? Kyle Sonnet is the main protagonist of the story, and instantly you feel a sense of empathy towards him. The early chapters of the book point out themes of isolation and loneliness; illustrated by Kyle’s childhood background of growing up in an orphanage. Now, he has left his younger years and is trying to find his feet. However, when he lands this job and is stated that he “cannot quit”, as a reader, you soon realize that Kyle’s luck has not improved. What I loved about this book is how the story follows the life of a young adolescent who is simply trying to find his way in the world. Instead of finding a job to gain some independence, Kyle soon realizes that he is in over his head. As the story unfolds, we soon realize that the issue of population control alongside the collapse in the healthcare system, means that euthanasia has taken over. Kyle finds himself in the middle of a conspiracy when he witnesses something of utter horror; Kyle needs to make a crucial decision. Does he continue with his job and accept what has happened, or does he face a challenging escape and risk his life in attempt for resolution? The story moves at a steady pace, and I was pleasantly surprised by the twist in the narrative. What makes for good reading is uncertainty and uniqueness, and I believe the author of The Wagon Driver does this remarkably. The grammar and punctuation is strong, and the narrative is creative and unique. The Wagon Driver, a book full of entrapment, isolation, and shock is a great read. An emotive, intriguing and dramatic novel set in a dystopian American society. The story goes against the American dream, and instead shows real concern and fear, in the hope that things can change. At the expense of everyone, the world and how it is portrayed is now simply in the hands of a naïve, inexperienced eighteen-year-old boy.